Visual Science and the Skoltech Institute are pleased to offer a precision 3D animation of the CRISPR gene-editing system. 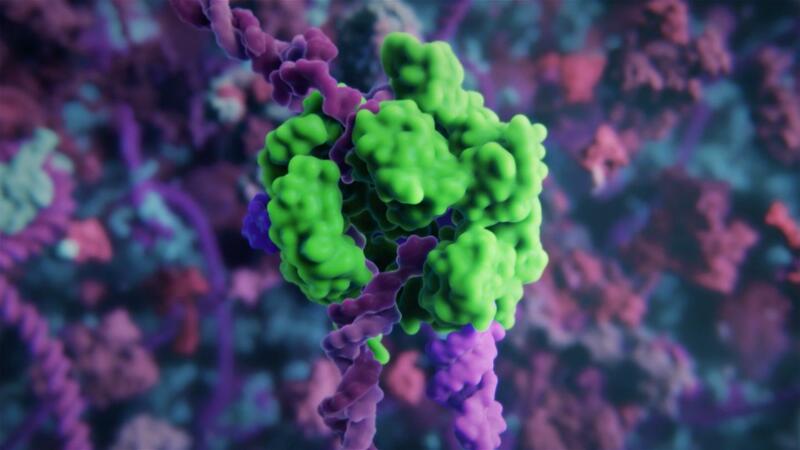 It's the first scientifically accurate 3D animation of CRISPR based on real molecular structures. This animation and the related collection of 3D illustrations and Coubs (more info below) are an ideal supplement to your coverage of cutting-edge medicine and genetics. The CRISPR systems visualization project was created by Visual Science biologists and scientific visualization experts with support from the Skoltech Biotechnology faculty. The animation is based on molecular modeling and dynamics, which allowed to produce accurate models of natural and engineered CRISPR complexes, as well as to visualize the interiors of the bacterial cell and human cell nuclei. Since the animation and related visuals were produced as part of nonprofit education project, we're prepared to license them free of charge. If you choose to use our visuals, please add caption "Animation by Visual Science and Skoltech" (with active hyperlink to http://www.visual-science.com/crispr ). 1. A 3 minute animation explaining the processes at work in both natural (bacterial) and gene-engineered CRISPR-Cas systems, as well as possible applications for human gene editing. The animation is based on actual molecular structures. 2. A collection of annotated 3D illustrations demonstrating specific processes in the CRISPR-Cas system and models of its biological components. Please note that image modifications, distortions and the derivatives are not allowed. 4. A set of 3 Coubs with key molecules. Coub is a GIF with sound — a short animation loop in special player. The Coubs show molecules in action and can be annotated for different audiences. Annotation: "Everybody got used to the CRISPR-Cas9 abbreviation, however natural CRISPR effectors in bacteria are not limited to Cas9 – there are multiple CRISPR complexes in various bacteria that might be useful for genetic engineers in future"
Annotation: "CRISPR-Cas9 complex cuts DNA in the specific site that is determined by the sequence of the crispr-RNA molecule that complex includes. By changing the crispr-RNA scientists can programm the complex to cut almost any desired sequence. This mechanism is the basis of the CRISPR-mediated genom editing"
Annotation: "CRISPR-Cas complex can be modified to bind DNA without cleaving it. In such cases Cas9 can be fused with fragments of other proteins, creating non-natural fusion proteins complexes that bind DNA at programmed sites and then alter gene expression, remodel chromatin structure or mark desired regions of the genome"
Visual Science is an award-winning scientific visualization, communication and education company. Founded in 2007, it develops 3D animations, augmented and virtual reality (AR and VR), educational content, medical illustrations, interactive science apps, and more. Since 2010, our projects have attracted millions of views from 148 countries, and have been featured in The New York Times, Los Angeles Times, Nature, PBS, New Scientist, VICE, Newsweek, VR Scout, Mashable, National Geographic, Popular Science, Wired, Spiegel and other media outlets. Visual Science created the first complete, scientifically accurate model of the HIV virus at the atomic level. The company's 3D models of the HIV and Ebola viruses were awarded "Best Illustration" (2010) and "Honorable Mention – Infographics" (2011) respectively by Science Magazine and the National Science Foundation. The Skolkovo Institute of Science and Technology (Skoltech) is a private research and academic institute founded in 2011 in collaboration with the Massachusetts Institute of Technology (MIT). Located in Skolkovo, Russia, a suburb of Moscow, Skoltech educates innovation leaders and fosters new technologies aimed at addressing critical global issues. Skoltech's Biotechnology faculty offers MSc and PhD programs that focus on the data-intensive fields of biomedicine and biotechnologies, with an emphasis on bioinformatics and mathematical biology. The faculty's international collaborators include scientists from MIT, NIH, Rutgers University, the Pasteur Institute and other premier institutions worldwide. Scientists learned how to modify natural CRISPR-Cas9 system and program it to recognize almost any desired DNA sequence in human, animal, plant or any other cell. After the recognition CRISPR effector can bind the target DNA at programmed site, cut it or in case of additional modifications to the system, alter gene expression, remodel DNA spatial organization or mark desired regions of the genome. Native and engineered CRISPR–effectors are precise, adjustable and easy to use DNA-editing tools that have a tremendous potential for multiple applications in curing genetic diseases, designing new and improved crops, fighting pests and conducting cutting-edge basic research.